Decorative early map of the United States Southeast with Florida as an Archipelago. Gli Stati Uniti dell' America delineati sulle ultime Osservazioni. Quinto Fogloi che comprende La Georgia, e parte della Carolina con, la Florida. A spectacular 1797 Giovanni Maria Cassini map of the southeastern part of the then fledgling United States. 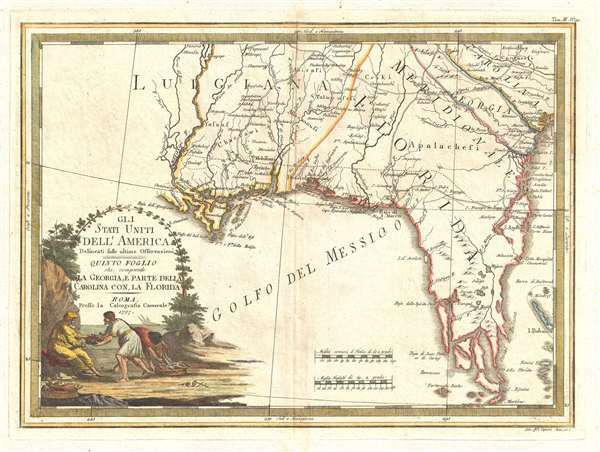 Centered on Pensacola, the map covers rom the Mississippi River to the Atlantic Seaboard and from Fredericksburg to the Florida Keys, including the modern day states of Florida, Georgia, Alabama, and Mississippi, as well as parts of Louisiana and South Carolina. Florida is illustrated in archipelago form, as was coming at the end of the 18th century. Being a somewhat large scale production, the map offers excellent information on the interior, including the deportment of American Indian tribes and villages. A highly decorative title cartouche appears in the lower left quadrant and features a fisherman sharing his haul with an elderly man. Cartographically Cassini derived this map from the 1778 Zatta 12 sheet revision and expansions of the John Mitchell's seminal 1755 map of the eastern part of North America. Cassini published six maps of United States regions based upon Zatta's work, of which this is map no. 5. This work was published in Cassini's 1797 Nuovo Atlante Geografico Universale. Today all maps from this series are highly sought after for their exceptional beauty and fine engraving. Giovanni Maria Cassini (1745 - 1824) was a Rome based Italian mathematician, globe maker, geographer, engraver, and cartographer active in the later part of the 18th and early 19th century. He was a disciple of Giovanni Battista Piranesi. He invented new form of projection used for an atlas of the kingdom of Naples issued by Giovanni Antonio Rizzi Zannoni. Cassini is best known as a globe maker and is considered the last of the great 18th century globe makers. His maps are distinctive for their fine engraving, dark strong impressions, and elaborate distinctive cartouche work. Unlike many map and atlas publishers of the period, Cassini did all of his own engraving work - this impregnating each map with his unmistakable style. Though he produced a significant corpus of well-regarded work, little is known of Cassini's personal life. G. M. Cassini is often mistakenly associated with the well-known French cartographic family of the same name, however, they are not related. Cassini, G. M., Nuovo Atlante Geografico Universale, (Roma : Presso la Calcografia Camerale) 1797. Giovanni Maria Cassini's Nuovo Atlante Geografico Universale was published between 1792 and 1801. The atlas consisted of three volumes, published in 1792, 1797, and 1801, respectively. The first volume was dedicated to 24 globe gores, 12 terrestrial gores and 12 celestial gores, printed in three gore sections, which could be demounted from the atlas and, following Cassini's provided instructions, constructed into a globe. The terrestrial globe is based upon Captain James Cook's voyages, the last of which aboard the HMS Resolution was completed in 1779. The celestial globe makes use of the research of John Flamsteed (1646-1719) and Nicolas Louis de Lacaille (1713-1762). The second and third volumes contains geographical maps. The second volume in particular, features important maps of America and Asia. Cassini published this atlas in Rome. Good. Minor centerfold wear. Wide margins. Blank on verso. Platemark visible. OCLC 18563829. Huntington Library, 150258.